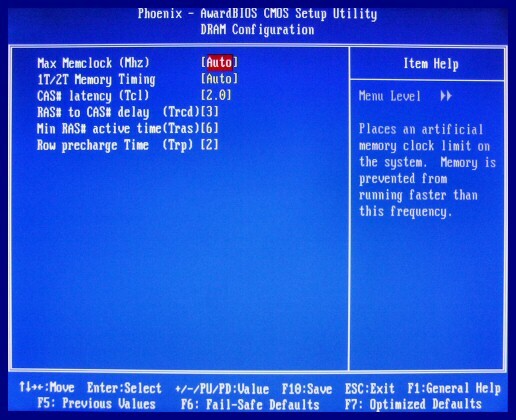 This FAQ article takes a look at the various BIOS settings available on AMD 64-bit platforms. It covers settings relating to the CPU and RAM in particular. If you were wondering what all those settings in the BIOS screens are for, then read on. As many of you will already know, the motherboard's BIOS can be configured via a variety of settings which can be accessed during system boot-up. On most modern systems, pressing the delete key when the splash screen is displayed will force the system to enter the BIOS utility. 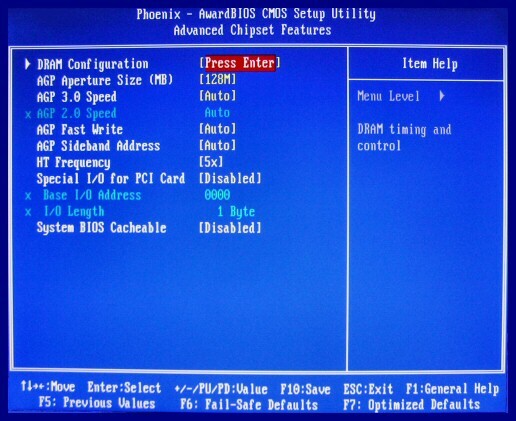 Consult your motherboard manual if you are unsure of how to run the BIOS utility. You will notice that detailed descriptions of the various functions are hard to come by in most manuals. This is where this guide will help you with clear explanations of settings which can be adjusted. This guide maily looks at CPU, AGP and memory settings and should be of help to those who are new to overclocking. The screen-shots in this FAQ are taken on an EPoX 9NDA3+ motherboard which has a Pheonix BIOS. The exact appearance of the screens and settings available may vary on other boards. In essence, the functions will be the same on all AMD64 platforms. 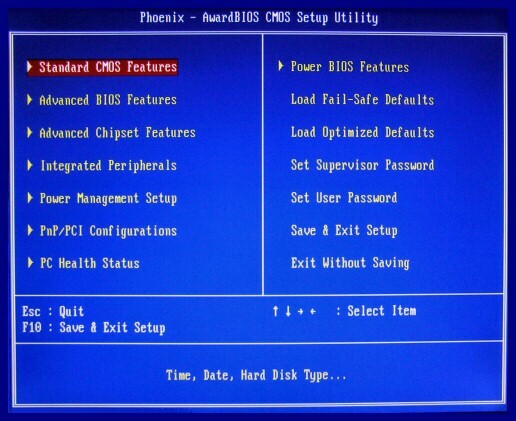 The photo below shows the BIOS main menu. I won't be looking at "Standard CMOS Features", "Advanced BIOS Features" or "Power Management" in this guide. Those sections mainly relate to time/date, system power and drive configuration. If you should need help with setting-up disk drives just ask in AOA's forum. Click here for the General Hardware topic. We will take a look at this area first because it allows viewing of various sensors on the motherboard. It is a good idea to keep an eye on these readings whilst making adjustments to other settings and in particular when overclocking the CPU or RAM. Be aware that the readings shown are not guaranteed to be fully accurate. Precise readings can only be made with external instruments such as temperature probes and multi-meters. The screen shown below will be similar on most systems, regardless of wether it is 32-bit or 64-bit. The speed, in RPM, will be shown for all fans which are hooked-up to the fan connectors on the motherboard. I this case none are so all speeds are zero. The CPU is watercooled, hence no fan. Note that the smart fan feature has been disabled because of this. When enabled it will allow the fan speed to automatically change according to temperature. The current voltage reading is shown here. Note that the voltage setting is not displayed, but the actual current voltage according to the sensor. The voltage will fluctuate on an AMD64 system, see more on this later. AGP refers to the graphics card port. It is very important for the AGP voltage to be set to match the voltage requirement of the graphics card used. Generally, it is not advised to run this at higher voltages. In this case the chipset is the nForce 3 Ultra chip which is located on the motherboard underneath a heatsink cooler. If running at a higher voltage, improved cooling is usually recommended. The power supply has a 5 volt line. This reading shows the actual voltage on that line. In this case it is well within tolerance. The DIMM's are the dual inline memory modules otherwise known as RAM. Exact voltage requirements will vary according to the modules used and whether the memory speed is increased above stock. There is a small disc shaped battery on the motherboard which maintains power to the CMOS memory, so that BIOS settings are not lost when the mains power is disconnected. This reading allows easy verification of the battery's charge. The 5V standby voltage is an always-on power line this maintains power to certain devices whilst the system is in sleep mode. 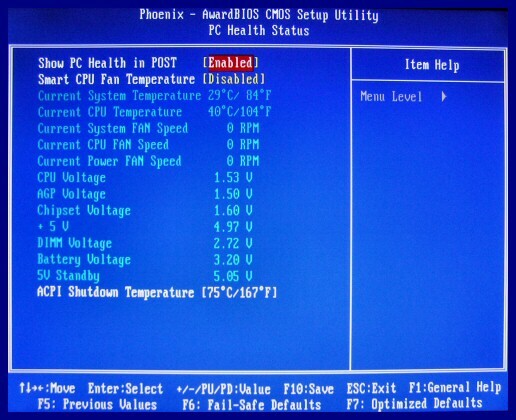 The ACPI shutdown temperature can be set or disabled as needed. The system will automatically shutdown at the specified temperature to avoid damage from overheating. Here we will take a look at features including AGP and memory settings. Bear in mind that this guide is based upon an AMD 64-bit platform and some of these settings may only be found on systems of this type, HT frequency for example. The AGP aperture size is specified in mega-bytes. This provides extra work space for the graphics in system memory. In a system with ample RAM and a 64MB graphics card this could be set to 64MB. However, when using graphics cards with say 256MB, setting the AAS to 256MB might harm overall performance because applications could be left with too little system memory. It is just a case of getting the right balance according to physical memory available. Note that AGP settings will have much the same function on all systems, not just 64-bit boards. Should you need further help, then ask for it in AOA's graphics hardware topic. When enabled the CPU will write directly to the graphics card. Expect to see a performance increase with graphics when fast write is enabled. The graphics card must support this feature, otherwise crashes may occur. Be aware that fast write can cause issues, so test the system after enabling it. When enabled, SBA allows 8 extra address lines to be used in addition to the main 32 lines. This should give a performance benefit, however stability tests need to done. This feature helps to give AGP a performance edge over PCI slots. HT is AMD's Hyper Transport technology and is found on AMD 64-bit platforms. In depth documents explaining this technology are available to download from AMD's website. In this case the frequency can be adjusted via a multiplier of 1, 2, 3, or 5. For example, 4x 200Mhz = 800MHz. The maximum stable speed for the HTT will be dependant on the hardware used and settings available in the BIOS. Higher HTT speeds allow greater bandwidth between CPU and RAM. In simple terms, HTT supercedes the Front Side Bus. Enabling this will place the BIOS in to system memory for faster access. It is unlikely to be of any real benefit it modern systems or may even harm performance, hence I have it disabled. Only of use on systems running old operating systems. This sub-section allows configuration of the RAM speed and timings. It is important for these settings to be correct to avoid crashing. It is a good idea to have all the exact details and specifications for the memoery modules to hand before changing any specifications. There will be occasions where all the automatic settings simply do not work, so a little understanding of memory is needed. This setting can be used to force a set speed upon the installed memory sticks. So, you could limit some 200Mhz RAM (DDR400) to a speed of 166MHz (DDR333). This setting comes in useful when overclocking, it is in effect a memory divider. Any increase on CPU Mhz will be reflected here, regardless of the limit set. Meaning that the memory and CPU can be run asycronously giving more flexibility with overclocking possibilities. If not overclocking the 'auto' setting should serve best. Screen-shot taken on a EP-9NDA3+ motherboard, may vary on other systems. This relates to commands per clock (CPC). The 1T option is faster, however cheaper memory may not be able to run stable at this speed. When overclocking with quality memory it may be necessary to change to 2T at higher speeds. When trouble shooting memory set this to 2T. Timings such as CAS or Trp, for example, are specific to the memory modules installed. RAM with low latency timings will be faster than RAM with higher timings running at the same clock speed, e.g. DDR400. 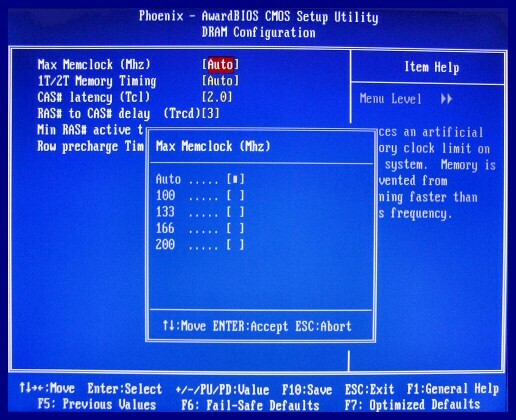 It is possible for the BIOS to use a set of timing tables which are stored on the memory modules, this is known as 'by SPD'. Alternatively, timings can be entered by hand on this screen. The correct stock timings for branded memory can be found on the vendor's website or printed on the sticks. When overclocking the memory speed it is likely that slower timings will need to be used. A case of 2 steps forward and 1 step back, if you like. If overclocking the memory use a tool which will measure bandwidth to ensure that the settings being used are actually faster. A certain degree of personal preference comes in to play here. In this section we'll take a look at CPU settings and voltages. 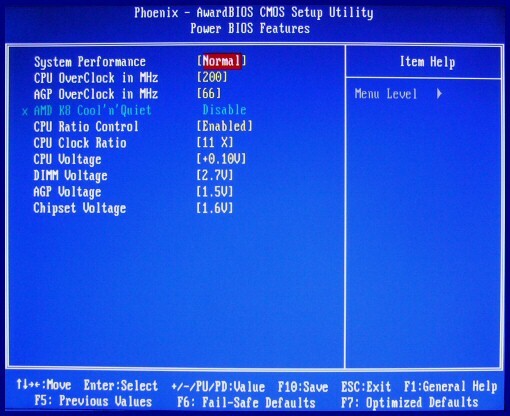 On the 9NDA3+ board these are known as Power BIOS Features because they are core to overclocking the system. These features may appear on different screens depending on the motherboard model. The CPU speed is set using a combination of two factors, the CPU clock ratio and the core clock speed. This is the core speed of the CPU, which in this case is 200 MHz at stock speed. The stock speed will vary according to the CPU specifications. Some 32-bit CPU's have a core speed of 166Mhz, for example. Many CPU's are quite capable of running at higher speeds, the upper limit is really a matter of luck of the draw. This setting can be increased in increments of 1 MHz. This number is multiplied by the CPU MHz to give the CPU speed. So, 11x 200 MHz results in a speed of 2200 Mhz. The multipliers available are generally dependant on the CPU specifications and are restricted on some CPU's. This is known as multiplier locking which is carried out by the manufacturer. It is possible to unlock the multipliers on some CPU's. When overclocking it may become necessary to increase the CPU voltage. Great care must be taken to avoid overheating at higher volatages. Good CPU cooling is a must. Allows adjustment to the RAM voltage. Again care must be taken. Generally, this should match the specified requirement for the installed graphics card. Can be increased a little to aid with overclocking, but often there is no need. Overheating can become an issue at higher voltages. When enabled the processor speed and voltage will vary according to load on the CPU. Under small load the CPU will underclock automatically to reduce heat output and power consumption. This feature needs to be disabled when overclocking. If you require further help, why not consult the forum.